American Conservatism Has Left Me. My daughter Stacey and I are planning to go on a short-term mission trip to Pine Ridge Indian Reservation in southwest South Dakota this August. The trip will be with about 20 other people from my church, Fairfield First Baptist, and is through Next Step Ministries. This is the first in a series of blogs I’ll be writing about the trip. Pine Ridge has 8 times the United States rate of diabetes. The alcoholism rate is estimated as high as 80%. The median income on the Pine Ridge Reservation is approximately $2,600 to $3,500 per year. The unemployment rate on Pine Ridge is approximately 83-85%, and can be higher during the winter months. About 97% of the population lives below Federal poverty levels. 1 in 4 infants is born with fetal alcohol syndrome or effects. Teen suicides occur at a rate of 4 times the national rate. School drop-out rate is over 70%. Teacher turnover is 800% that of the U.S. national average. Infant mortality is three times the national rate. Life expectancy on Pine Ridge is the lowest in the United States and the 2nd lowest in the Western Hemisphere. Only Haiti has a lower rate. There are an estimated average of 17 people living in each family home (a home which may only have two to three rooms). Some larger homes, built for 6 to 8 people, have up to 30 people living in them. Over-all, 59% of the Reservation homes are substandard. Over 33% of the Reservation homes lack basic water and sewage systems. 39% of the homes on the Pine Ridge Reservation have no electricity. At least 4,000 new homes are needed on the Reservation in order to combat the homeless situation. The Oglala are one of the seven subtribes of the Lakota tribe, who along with the Nakota and Dakota, comprise the Great Sioux Nation. Prior to the Lewis and Clark Expedition of 1804–1806, the Lakota had little contact with non-indigenous people, other than a few traders. 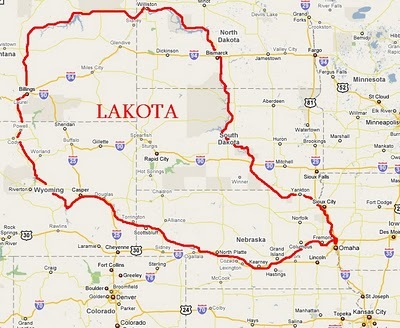 At one time, the Lakota controlled a vast area of the Great Plains, including parts of Nebraska, North and South Dakota, Wyoming, and Montana. In 1851, the United States government negotiated the first Fort Laramie Treaty with the Lakota and several other tribes in order to secure the safety of travelers on the Oregon Trail. The Indians were to receive an annuity in the amount of fifty thousand dollars for fifty years. The U.S. Senate promptly adjusted the compensation from fifty to ten years, then failed to actually deliver most of the commodities promised as payment, and did not enforce other treaty provisions. In response, the Lakota and others attacked settlers, causing public pressure on the US Army to punish them. A series of battles between the Lakota and the U.S. Army followed. The 1868 Treaty of Fort Laramie ended this war. 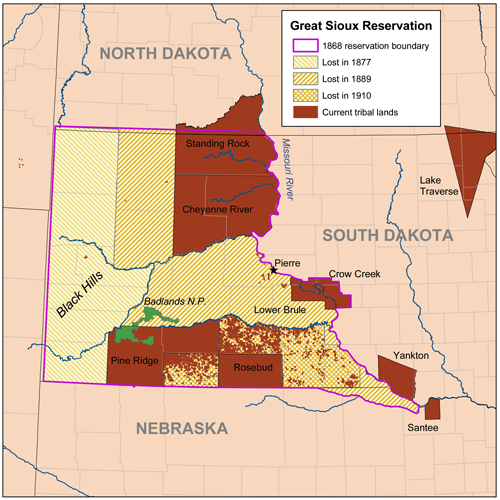 The treaty established the Great Sioux Reservation, which comprised the entire western half of South Dakota, including the Black Hills. The Black Hills were (and are still) considered sacred by the Lakota. The treaty provided for hunting privileges in areas of Nebraska, Wyoming, Montana, and North Dakota until the buffalo were gone, as well as for schools, clothing, blankets, and food rations. It also called for land allotments to be made to individual Indians. When gold was discovered in the Black Hills in 1872, the U.S. government refused to enforce provisions of the 1868 treaty keeping miners out. Despite the fact that the 1868 treaty required that ¾ of all adult Lakota males had to approve any land deals, and that the Lakota overwhelmingly refused to sign the new treaty, the U.S. Congress ratified Indian Appropriations Act of 1876, which cut off all rations for the Lakota until they ceded the Black Hills to the United States, effectively stealing the Black Hills from the Lakota. The government also began the systematic destruction of the buffalo herds that the Lakota relied on for food and shelter. This forced the Lakota onto the reservations in order to receive food allotments, or to starve. Once on the reservations, the government again ignored treaty provisions by reducing food allotments, causing widespread illness and death due to malnutrition. The Dawes Act of 1887 forced the Lakota to divide the Reservation land into allotments for individual Indians, and to sell off “excess” lands to white settlers. It was designed to force the Lakota to become “civilized” by becoming farmers and abandoning traditional tribal structures and traditions. However, because the land was unsuitable for farming, and due to severe drought, the Lakota were reduced to near starvation. In 1890, in part due to the desperation of the Lakota people, a religious movement known as the Ghost Dance arose. It was believed that the dance would reunite the Lakota with spirits of their dead ancestors, make the whites leave, and bring unity, prosperity, and peace. Unfortunately, many white settlers felt threatened by the movement, fearing it would lead to a new round of war with the Indians. The military was called in. On December 15, 1890, 40 Indian policemen tried to arrest Chief Sitting Bull, a supporter of the Ghost Dance, killing him in the process. After Sitting Bull’s death, about 200 members of his followers, fled and joined Chief Spotted Elk, and attempted to travel to Pine Ridge for protection. On the way, they were met by a 7th Cavalry detachment under Major Samuel M. Whitside. On December 29, 1890, while camped next to Wounded Knee Creek, the military attempted to disarm the Indians. After a scuffle, a shot was fired, then the military opened fire on the Indians. A massacre ensued. In less than an hour, at least 150 Lakota men, women, and children had been killed, and many more wounded. Some estimates put the total casualties (dead and wounded) at around 300 of the approximately 350 Indians in Spotted Elk’s group. Many of the women and children fled into a nearby ravine, where they were systematically hunted down and shot. The Wounded Knee Massacre effectively ended all Lakota hopes of a return to the pre-reservation way of life. Approximately 46% of the residents on Pine Ridge Reservation are affiliated with a religious congregation. Nearly half of those are affiliated with the Catholic Church, and a little over a quarter are affiliated with the Episcopal Church. The rest are spread between various evangelical churches, mainline Protestant churches, and a smattering of others. The Oglala Lakota are very spiritual people. Although not affiliated with a church, most hold to some variation of traditional Lakota beliefs, and many affiliated with churches combine some traditional beliefs with their Christian beliefs. According to Lakota tradition, the Lakota were given their culture by a sacred person, the White Buffalo Calf Woman, who gave the people the sacred pipe along with a promise to teach them the ceremonies and standards for living as a united tribe. This pipe links the Lakota to their relatives the buffalo, who would give their very lives to sustain their kin. The Lakota language has no word for religion. The sacred are not restricted to certain times, places, or activities – the Lakota held and many continue to hold that all is sacred. Religious revelation through personal quest, dreams, and visions remains an important part of their dynamic belief system. Lakota religion teaches that everything has a spirit, and many Lakota worship the spirits. The Great Spirit is the most powerful of all – the traditional Lakota God. There are many Christian organizations that do mission work on Pine Ridge. Most center around building projects and other ways of trying to improve the living conditions on the Reservation. Many of the Oglala appreciate the work these groups do, but many others have a deep opposition to Christianity and Christians. Many feel they have been stripped of everything they once had, and that their traditional religious beliefs are all they have left. Others resent that religion, especially Catholic and Episcopalian churches, was shoved down their throats in the deliberate attempts to “civilize” them by forcing them to give up their traditional ways. Because I will be spending a week in August on the Pine Ridge Reservation as a missionary, I felt it was critical that I learn as much as possible about the people I will be ministering to. The Gospel isn’t about changing culture; it’s about introducing people to Jesus Christ. Part of evangelism involves understanding the people being evangelized in order to be able to present the Gospel message in a relevant way. The message doesn’t change, but how it’s presented must be tailored to fit the understanding of those with whom it’s being shared. Part of always being ready to give a defense of the Gospel to everyone who asks us about it (1 Peter 3:15) is to anticipate the probable objections to the Gospel that a particular group might raise, and to prepare Biblically-solid answers. In Lakota culture, one must earn the right to be heard. The way to earn that right is by building relationships, and relationships are built through understanding and trust. At this point, my goals for the trip are: 1) help improve someone’s life through building projects; 2) build relationships through service and friendship; and 3) when given the opportunity to be heard, present the Gospel in a way that it can be understood and received. My hope is that the preparation, study, and prayer I have undertaken will allow me to have an impact on someone’s life with the Gospel. There is great spiritual warfare on the Reservation. The worship of spirits opens the door to demonic activity. Many of the suicides at Pine Ridge have been directly attributed to bad “spirits” telling people to kill themselves. Please pray for the Lakota people on Pine Ridge Reservation, and for the Christians (both natives and non-natives) working to spread the Gospel and improve living conditions. Bad choices – even a single bad choice – can lead to death and destruction. Recently, a coworker and friend was sentenced to several years in prison for killing a man in a drunk-driving accident. Brian (not his real name) left work a little after 10:30 one night a few days before Christmas, and stopped by a bar for a few beers and a few games of pool. After having more than just a few beers, he got in his car to go home. On the way, he hit another car, pushing it into oncoming traffic. The driver of the car he hit died; Brian nearly died as well. Brian had no criminal history prior to this incident. He’s a quiet, laid back, hard-working guy in his late twenties. The closest he’d ever come to a brush with the law was a ticket for an expired tag on his license plate. Because he made one mistake – one very bad decision – a man is dead, and a family has been shattered by the loss of a husband and father. Brian’s life has been ruined as well, and his own family has been devastated. As much as I grieve for the victim and his family, I was hoping the judge would go easy on Brian. After all, he’s a good guy, with a nearly perfect driving record up until the accident. He made a single bad decision. He’s apologized, and is truly sorry for the mistake he made. Surely, the judge could take into consideration all the good Brian has done in his life, and let him off easy. However, the more I thought about it, the more I realized that for the judge to go easy on Brian, maybe giving him probation and community service, would be unjust. Brian’s actions that night cost a man his life. Brian’s one bad choice overrides all of the good he had done in his life; he deserved the sentence he received. Justice demanded that the judge send Brian to prison. The more I’ve thought about it, the more I realize, it’s much the same with us and God. Most people do more good stuff than bad. Most of us wouldn’t intentionally hurt someone else. We do a lot of good things for other people. Sure, we make mistakes, but we do a lot more good than bad. And, most of us haven’t killed anyone. Surely, when we die, and face God for judgement, a loving God will look at the good and the bad, and the good will outweigh the bad, and He will let us into Heaven, especially if we’re really sorry and apologize. Much like in Brian’s case, one bad choice makes all the difference. God is not only loving; He is also holy and just. God’s holiness demands that the standard for goodness is perfection. And, God’s perfect justice demands punishment for anything short of perfection. As it says in James 2:10, “For whoever keeps the entire law, yet fails in one point, is guilty of breaking it all.” A single sin condemns a person to an eternity separated from God. How can Brian’s one bad choice outweigh all the good things he has done? Doing good things does not erase the bad things we do. Apologizing, feeling remorse, and promising not to sin again does not erase the guilt. No matter how many good things I’ve done in my life, I still deserve to be punished for the things I am guilty of. And,it’s not just one thing I’ve done wrong; over the course of my life, I’ve done thousands of things wrong, maybe even millions. Also, it’s not just other people I’ve sinned against; it’s God Himself, my Creator, that I’ve offended. It’s one thing to sin against another person; it’s quite another to sin against God. Here’s an analogy: If I shove a random stranger on the street, I could be charged with a misdemeanor assault charge. However, if I shove a police officer, I’ve now committed a felony. Why the difference? It’s due to the police officer’s position of authority over me. It is a greater offense to shove a police officer, because the officer has been placed in a position of authority. And, the greater the authority, the greater the offense. Shoving an everyday citizen is a misdemeanor, and shoving a police officer is a felony. And, if I were to shove the President of the United States, the penalty would be much greater than for shoving a police officer, because the President’s authority is much greater. When I sin against God, I am guilty of committing an offense against an infinite authority. A single offense outweighs all the good stuff I’ve done for God, because God is infinitely just and infinitely holy. And, I’ve committed a lot more than one offense. Therefore, the penalty is an infinite penalty – eternal damnation. Thankfully, in addition to being infinitely holy and infinitely just, God is also infinitely loving. God’s justice demands payment for sin. In His infinite love, God has provided an alternative to paying for sin ourselves – He has given us Jesus Christ. A just judge could not simply set Brian free, and the family of his victim may never forgive him. However, God offers Brian – and every other person on earth – freedom and forgiveness. I pray that Brian seeks forgiveness from God through Jesus Christ. I pray that God uses this horrific tragedy to reach Brian with His love, mercy, and grace, and that Brian comes to know God in a personal and intimate manner through Jesus Christ. I also pray God’s peace and healing on the victim’s family, and that they would also come to know Jesus. I also pray that if you, my reader, have not yet found forgiveness and mercy from God through Jesus Christ, that you would seek Him, and come to know Him in a personal, intimate way. It’s as simple as acknowledging before Him that you’ve sinned against Him, believing that Jesus Christ, God’s only Son, died to pay for your sin and take your sins from you, and receiving His forgiveness. 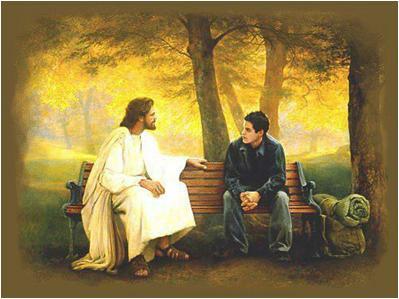 You can then begin an incredible journey of getting to know the Creator of the universe, and of becoming more like Him. It only takes one mistake to deserve Hell. It only takes one choice to receive forgiveness. Make that choice today. Today I will tackle the question of whether Christianity is a religion. It is my contention that there are, in fact, two distinct forms of Christianity: one form that is a religion, not different from any other religion, and another that is much more than just a religion. In order to answer the question, it is necessary to first define exactly what religion is. Religions have narratives or texts. Religion is a source of purpose and meaning. Religion is both a set of beliefs about God and a set of practices based on those beliefs. The more religious a person is, the more fervently the set of beliefs and practices is followed. Here we come to the crux of the question: Is Christianity a religion, or is it something more? I contend that there are, in fact, two distinct kinds of Christianity. There is a form of Christianity that is clearly religion. Catholicism, Evangelicalism, Protestantism, and Fundamentalism are all religions. They are all sets of beliefs with accompanying behaviors and practices. Even Christians who are not a part of any organized church or denomination ultimately have a religion. They have a personal set of beliefs and practices. This goes beyond simply knowing about Jesus; a true follower of Jesus Christ actually knows Him. I know a lot about the President of the United States. I see him on television and in my Facebook newsfeed nearly every day. I know what he says, and who he is. However, I cannot say I know him. We’ve never even met in person, and even if we had, he wouldn’t remember me from any of the hundreds of thousands of other people he’s met. Compare that to the relationship I have with my wife and kids. I live with them, and I talk with them regularly. I actually know them quite well, and they know me quite well. We have individual, close connections . So it is with those who truly follow Jesus. We don’t just know about Jesus, we know Him personally. He knows us personally. We don’t just follow a religion; we follow a person that we have actually met, with whom we have a personal relationship. Notice that it isn’t the religious people that enter heaven – it’s those who do the will of the Father and whom Jesus knows. What is the “will of the Father?” In the context of the passage, it’s certainly not being religious. Jesus repeatedly saves his harshest criticism for the most religious people in His culture. The will of God is that people would know Him. How are the two kinds of Christianity different from each other? Let me give my answer from personal experience. I grew up as a religious Christian. I was in a church service nearly every Sunday. My entire family was active in the church; my dad sang in the choir, and my mom was the Sunday School Superintendent. I was active in the youth group – president, my senior year – and went to church camp every summer. 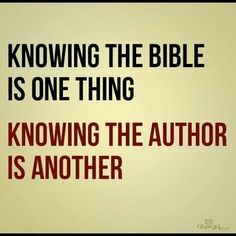 I knew a lot about the Bible, God, and Jesus. I participated in fundraisers to help the poor, vacation Bible school, and Bible study classes. Although I knew I did some bad things, I believed my goodness outweighed the bad. I believed, God is love; he accepts us as we are, warts and all. However, as a college freshman, I realized that this wasn’t enough. Although I knew a lot about Jesus, I didn’t know Jesus. And, though I was mostly a good person, I still sinned, and sin separates us from God – it prevents us from knowing Him. I discovered that God is not only a God of love, He is also the God of holiness, justice, and truth. It was then that I changed from the first kind of religious Christianity to the second kind – relationship Christianity. I repented of my sin, and from trying to earn my way to Heaven. I acknowledged that Jesus is God; that He died for my sin, and rose again. And I committed my life to follow Him. God then did an amazing thing. He forgave my sin, and He restored my relationship with Him. The Holy Spirit tool up residence in my heart (2 Corinthians 1:22). I now not only knew about Jesus – I actually came to know Him in a personal way. This is the difference between the two kinds of Christianity: The first is a religion, no different from any other religion. It has a holy book, doctrine, faith, rituals, and symbols, like any other religion. Religious Christianity provides social construct and purpose and meaning, as do all religions. Faithful religious Christians proselytize, as do the faithful from all other religions. And, like all other religions, religious Christianity does nothing to restore the relationship with God that has been lost because of human sin. It acknowledges that Jesus paid the penalty for sin on the cross, but does nothing to activate that forgiveness in anyone’s life. It’s sort of like starving to death while looking at a table full of food. Food does no good, unless one actually ingests it. That’s what relationship Christianity is all about: ingesting and applying the forgiveness offered by Jesus Christ, and beginning a relationship with Him. Yes, those who have a relationship with Jesus also have the Bible, doctrine, and faith. Yes, our relationship with Jesus is the source of our social construct, purpose, and meaning. We proselytize, and although for many of us, rituals and symbols aren’t especially important, we still have them. The key difference is that these things aren’t the foundation – our relationship with Jesus is the foundation. Is Christianity a religion? It depends on which kind of Christianity being discussed. 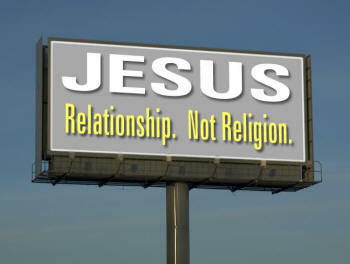 It has been claimed that, “Christianity isn’t a religion – it’s a relationship.” I only partially agree with this. A better way of stating this would be, “True Christianity isn’t just a religion – it’s a relationship.” Much of what people know as Christianity is a religion, and is ultimately no different from any other religion. It makes people feel good, and act a certain way, but cannot restore a relationship with God. The other kind of Christianity is a relationship with God, through the blood of Jesus Christ. This second kind of Christianity still has most of the marks of religion, but is much, much more than just a religion. Religious Christianity is based on trying to make one’s self acceptable to God, which cannot be done, and ultimately leads to death and Hell. Relationship Christianity is based on what Jesus did, not what we do. We become acceptable before God because Jesus took our sin on Himself. Relationship Christianity restores our connection with our Creator, and leads to eternal life, not Hell. What difference does this make? It makes all the difference in the world! If you are a religious Christian – you have the doctrine, faith, rituals, and symbols, etc., but you don’t know Jesus personally – your sins are not forgiven, and you have not had your relationship with God restored. You are headed for Hell. You need to repent of your religiosity, acknowledge that you cannot make yourself acceptable to God, and receive forgiveness and restoration through Jesus Christ. Head knowledge is not the same as a relationship. Religion makes people feel good, but leads to Hell. Stop having faith in religion, and place your faith and trust in Jesus Christ. If you profess another religion, or no religion at all, you also need Jesus. You may have a wonderful life, but in the end, you will spend eternity separated from God in Hell, unless you turn to Jesus. If you know Jesus already, you probably already understand this distinction. Make sure you keep your heart and mind focused on Jesus, not on all the religious stuff that accompanies faith in Jesus. Sure, the “religious” stuff, like reading your Bible, trying to do what is right, giving to the poor, and regularly attending corporate worship are important, they are no substitute for developing your relationship with Jesus. When you share your faith in Jesus with others, they will often think Christianity is no different from any other religion. In a sense, they are right – most of what they have seen is the religious Christianity, not relationship Christianity. Make the distinction between Christianity the religion and Christianity the relationship. 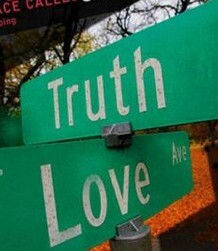 Both exist, but only one leads to eternal life. One final thought: the two kinds of Christianity are usually mixed together in any given church or denomination. That is, in most solid, Bible-believing churches, there are some that don’t actually know Jesus, along with those that do. There are also Christians who truly know Jesus in some very religious churches. Knowing Jesus isn’t a matter of whether one belongs to the right or wrong denomination or church. If you want to know more about knowing Jesus, leave a comment, or send me a message. I’d love to tell you more. Over the last week, the evening news and social media have been filled with the sad details of the suicide of comedian Robin Williams. Williams, who had struggled with depression and substance abuse for years, hanged himself, and was found dead on August 11. Social media has exploded with commentary on Williams’ life and death. Opinions have run the full gamut. Many of the comments blame his death on mental illness. Others call him a coward for killing himself. What I’ve found interesting is the comments from self-proclaimed Christians. As a Christian myself I take great comfort knowing that Robin Williams is indeed in Heaven. He brought laughter, support and happiness to so many and now is his time to escape his hell of depression and live with The Lord. Any other Christians that would claim otherwise should be ashamed of themselves and take another good look at their lives. What makes them better than Robin Williams? That answer would be, absolutely nothing. Rest in Peace Mr. Williams and thanks for the joy you brought to my life. As a Christian, I have always been offended by this notion that someone goes to Hell for this or for that. If that is the case, we are all in trouble. It makes no sense to me for God to create us, just to destroy us in the after life. God is compassionate, and none of us are without some sort of sin, even on our death bed. 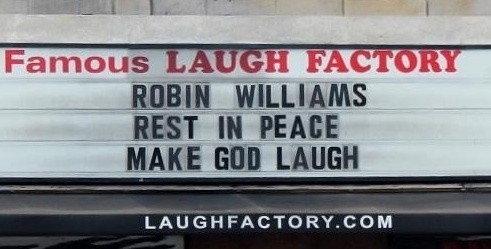 Those like Robin with depression issues that they cannot overcome on this Earth, surely is at peace in the kingdom. Just my perspective. Both Lisa and Donovan seem to be missing the entire point of the Gospel. It has nothing to do with being “better than” others, as Lisa suggests. Donovan was partially correct: none of us is without some sort of sin, and we are all in trouble. What both seem to be missing is the fact that God, being infinitely just, cannot simply overlook our sin. The penalty for sin is death and eternal separation from God – hell. Jesus took the penalty for sin upon Himself, fulfilling the righteous judgment of God. Nothing we do can make us “good enough.” It is only through Jesus Christ that forgiveness can be obtained. The only thing we can do is to receive Christ as Savior. If we accept Jesus as Savior, we are forgiven. If we reject Jesus, we go to hell. 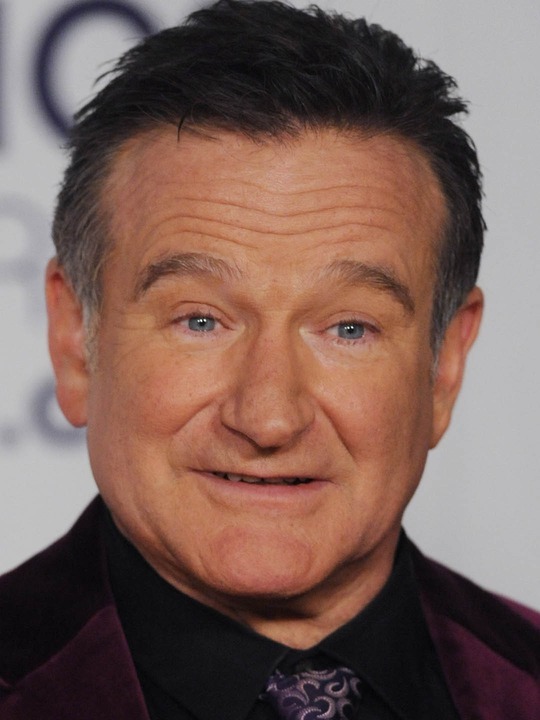 Robin Williams was well known for giving to a great number of good causes, often anonymously. He was, in human terms, a “good person.” However, in God’s terms, he was a sinner, as we all are. No amount of giving or good deeds can pay for our sin or get us into Heaven. Jesus said, “I am the way, the truth, and the life. No one comes to the Father except through Me.” Unless Robin Williams repented of his sin and received Jesus Christ as Savior, he is in Hell. While I don’t claim to know what God might have done in Williams’ heart during his last days on earth, there is absolutely nothing to indicate he ever was saved. Williams sometimes openly mocked Jesus Christ and the Bible in his comedy routines. And, while I do think deathbed conversions can be genuine, it seems extremely unlikely that a person can become truly saved – and then immediately kill himself. It is such a tragedy that there are so called “Christians” that seem happy about declaring that Robin Williams went to hell. I am a follower of Christ, I know that I did not know the state of mind of Robin Williams, and knowing Jesus does not mean that you cannot still suffer from severe depression. In the end what matters is what was in his heart those last few minutes of his life. I pray for his family that God will give them peace and comfort during this time. What kind of Christian would take pleasure in someone’s eternal damnation?????? I pray that Robin found his peace deep in the arms of the Saviour…… SHAME ON YOU PEOPLE THAT PROCLAIM CHRIST AND WISH HELL ON ANYONE!!!!!! One of the disturbing trends I’ve seen is a small minority of self-proclaimed Christians who seem to take pleasure from the fact that Robin Williams is most likely suffering in Hell. I’ve seen posts commenting that he “deserved” to be in Hell because he mocked God – implying that while Williams deserved Hell, the writer did not. It grieves me that Williams is, in all likelihood, in Hell. It grieves me that most people reject Jesus Christ and go to Hell. It grieves me that, because of my sin, I deserve Hell. I just thank God that, through His grace and mercy, He reached me with the truth of His forgiveness through the blood of Christ, and I received Jesus as Savior. It’s not because I’m better than anyone else, or that God loves me more; it’s because I responded to God’s offer of salvation, which He freely extends to all, yet most reject. It’s a sick person who wishes for anyone to go to Hell. I saw a comment somewhere to the effect that Robin Williams is in Heaven, making God laugh. In all probability, Williams is not in Heaven. God is not laughing; He is weeping. Satan is the one who is laughing. Don’t know if that would be technically correct or not; I have seen a couple of recent interviews where he referenced being thankful for “a loving God”. Perhaps he had found some level of connection…according to his level of understanding. I sure hope so. In any case, this sort of ‘speaking ill of the dead’…to the detriment of friends and family…is NOT a ‘Christian’ thing to do. 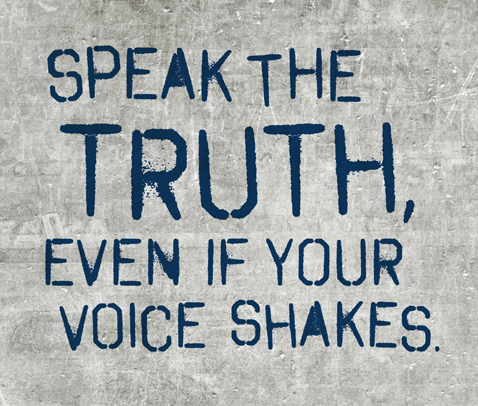 If you cannot “speak the truth IN LOVE”, keep your mouth shut. Belief is not simply an intellectual understanding. It involves commitment, repentance, and trust in the person and work of Jesus Christ. James 2:19 states that “Even the demons believe—and tremble!” Demons are condemned to Hell, not because they lack intellectual understanding, but because they reject Jesus Christ. The same is true of people. One thing Michael M. wrote that I wholeheartedly agree with: If you cannot “speak the truth IN LOVE”, keep your mouth shut. My fervent prayer is that anyone who reads this and doesn’t already know Jesus Christ as Savior will see this as a wake-up call to seek Jesus Christ, receive Him as Savior, and be saved. While Christians are commanded to preach the Gospel, we are also commanded to do so in love. Sometimes, the truth hurts. It hurts to realize I am a sinner. It hurts to know I deserve Hell. It hurts to discover there’s nothing I can do about it. It hurts to know that, in all likelihood, Robin Williams is in Hell, as will be most of the people I have known or admired. It hurts to know that God had to send His only begotten Son to die in my place. However, I fervently believe it is the truth. And, I love people enough to tell them the truth, not to make myself feel good, but in the hope that others will come to know Jesus Christ. If I didn’t love people, I wouldn’t care if they went to Hell. The most hateful thing I can imagine is to know the truth, and keep it to myself, not caring if others go to Hell, or not. To those who think you’re better than others, or that God loves you more: SHUT UP. You’re fools. Take the log out of your own eye, and quit trying to throw sawdust in the eyes of others. How about this for a thought! What if the way he died is a fail safe that God has in place for people who just can’t find him, but he still wants him as his own, so this unjust death so it may seem ,just means he is allowed to be with God eternally, but has to go out this way! I just don’t see a loving God giving up on his children so easily. While I disagree with the notion that suicide is an automatic ticket to Hell, I also disagree with the notion that suicide might be an automatic ticket to Heaven. Neither concept is found in the Bible. The Bible is clear. Salvation is based on whether or not one has repented of sin and received Jesus Christ as Savior. Those that receive Christ go to Heaven; those who do not go to Hell. My hope and prayer is that all of the discussion about the death of Robin Williams will cause some to seek the truth in Jesus Christ and be saved. I pray that other Christians will use Robin Williams’ death as an opening to share the Gospel and lead others to faith in Christ. I also pray that the hate-mongers and self-righteous legalist would just shut up, repent, and seek forgiveness. The reason we are writing to you is that we have the opportunity next summer to join with our church, Fairfield First Baptist, to provide hope in a world of brokenness by going on mission trips to Monterrey, Mexico and Pine Ridge Indian Reservation in South Dakota. In August, Stacey will have the opportunity for a second mission trip before she heads off to Liberty University, this time to the Pine Ridge Indian Reservation in South Dakota. 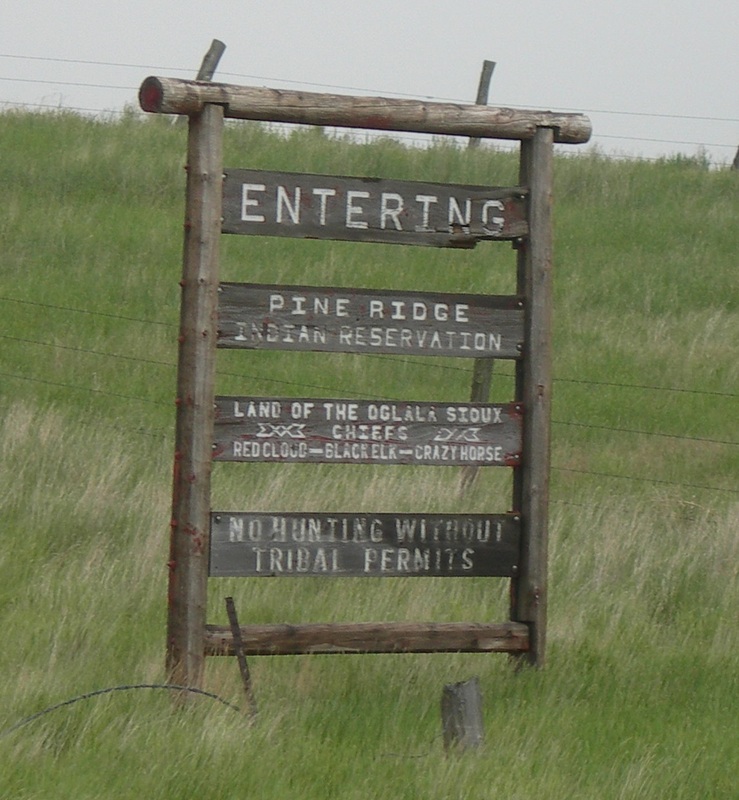 Pine Ridge is an Oglala Lakota Native American reservation, and is one of the poorest communities in the United States. The poverty on Pine Ridge is devastating. It is common to find homes overcrowded, as those with homes take in whoever needs a roof over their heads. Many homes are without running water or sewer, adequate heating or air conditioning, and have black mold. The unemployment rate is about 80-90%, with a per capita income of around $4,000. Life expectancy on Pine Ridge is the lowest in the United States and the second lowest in the Western Hemisphere, behind only Haiti. Alcoholism and suicide are the leading causes of death. Stacey and our church will be working with Next Step Ministries to serve in the Pine Ridge community to help rebuild the reservation and restore the hope and beauty buried deep among the brokenness found here. We will have the opportunity to serve in a number of ways, working with families and their children, meeting residents on a daily basis, restoring and building upon relationships with community members, rebuilding homes, churches, or trailers, roofing, drywall, and painting. Throughout this week, we will be acting as the hands and feet of our Lord to serve this community in a valuable way. It is exciting to think that Stacey can be a small part of that! We are writing to you because we will by relying on friends and family for support as we prepare for the trip and while we are gone. Between the three trips, we need to raise nearly $3000 for trip expenses. First and foremost, we ask for your prayers. Please pray for the orphans in Monterrey, the workers in their Children’s Homes, and for the people donating time out of their summers to take trips to Mexico to work to improve the children’s lives. Pray for the Oglala Lakota people of Pine Ridge Reservation, that they would have hope, and pray for those who are working to bring them hope. Please also pray for Stacey and Joey, that they would be able to raise the funds necessary, and that God would be preparing them for the work He has planned for them. Secondly, if you are able, we would greatly appreciate any financial support you might be able to provide. We need to raise nearly $3000 for the three trips. Gifts are tax deductible, and checks should be made payable to Fairfield First Baptist Church, with Stacey/Joey Wendling Mission Trips in the memo line. Should you feel called to give in support of the missions effort in Mexico and South Dakota through giving to Stacey and Joey Wendling, please fill out, cut off, and return to the address below. Gifts are tax-deductible. Please make checks payable to Fairfield First Baptist Church. Why Aren’t More Intellectuals Believers? A recent article by David Denison looked at the question of why few intellectuals are Christians. He noted that, according to a survey of the National Academy of Scientists, only 7 percent of American scientists believe in a personal God. Denson argues for two primary reasons for this tendency. First, there is a tremendous bias against theism within higher education; and second, the American church culture is unfriendly to intellectual scrutiny. I would agree with Denson’s assessment on both points, but I would take his conclusions a bit further. 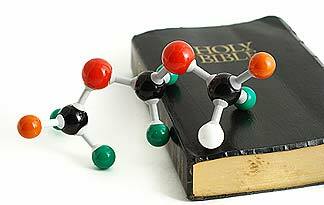 Scientists study the physical world, which they should see as God’s handiwork. However, because many highly intelligent people trust their intelligence above all else, they choose to ignore or explain away the very obvious creative design found in the natural world. Intellectuals really aren’t any different than anyone else. Athletes rely on their athleticism; the wealthy rely on their riches; those in power rely on their position. When a person has a lot going for them, it’s difficult to realize that they need anything other than themselves, and it’s easy to reject the truth. I think the reason why people who seek higher ed, especially in scientific and theoretical fields, tend to be non-religious is simply because logic and the scientific method play such a vital part in how we think. Faith, in almost complete contrast, is, by definition, believing in something without all of the necessary evidence. First of all, let’s get a common misconception of science out of the way. Science is not about “knowing stuff” – it’s a process of 1. constructing a hypothesis to explore, based on current knowledge, 2. testing that hypothesis and broadcasting the results to the greater community, so that other scientists can 3. try to disprove your results from as many angles as we can think of, until we aren’t able to disprove it, at which point it becomes added to the list of theories that form what we know about the world (which is constantly changing). An important thing to note is that nothing can be absolutely known, because we don’t know the methods, nor do we have the resources, to test everything completely. Every atheist I talk to about the Christian faith gives me the same reason for not believing: There is no evidence for the existence of God. The flaw in their thinking is that they believe the only way one can absolutely know anything is through the scientific method. They reject any other kind of evidence. Since God is not observable and testable, they argue, there is no evidence for God’s existence. However, there are many things that people know – or claim to know – that are not subject to the scientific method. For example, scientists know their senses are basically reliable, but there is no way to test this, because if their senses were not reliable, they could not reliably make the observations necessary to test whether their senses are reliable. They presuppose that the universe is real, and not imagined, but this cannot be tested. The scientific process itself cannot be tested and proved by the scientific process – there is no way to test the hypothesis that observing and testing a hypothesis produces truth. There are many kinds of evidence other than scientific evidence, including historical evidence, testimonial evidence, metaphysical arguments, anecdotal evidence, logical arguments, and others. Most scientific intellectuals that I have talked to reject all of these, except the scientific process. The problem is not that there is no evidence; the problem is that there is no evidence that they will accept. Demanding physical evidence for the existence of God is a category error fallacy. A category error is “a type of informal fallacy where things that belong to one grouping are mistakenly placed in another,” or where “a property is ascribed to a thing that could not possibly have that property.” If someone says, “My gerbil is a Republican,” they are committing a category error – a gerbil cannot be a Republican. Only people can be Republicans. Gerbils do not belong to the category of things capable of being a Republican. The Biblical God is not a physical Being. He is not part of the natural universe. By definition, God is supernatural (super- “Above; over;” natural “Present in or produced by nature”). God is in a totally different category than the natural universe. When someone demands physical evidence for the existence of a non-physical Being, they are committing a category error fallacy. It would be like demanding DNA evidence for the existence of dark matter, or asking for a beaker full of intelligence. Scientists are trained to use the scientific method to test theories. This is absolutely appropriate for gaining knowledge of the physical world. The category error fallacy is in trying to apply the scientific method to non-physical concepts. Because the scientific method plays such a crucial role in how many intellectuals think and work, it’s often difficult for them to think in any other terms. Is the American church culture unfriendly to intellectual scrutiny? Unfortunately, for the most part, the answer is yes. Most preachers and church teachers tell their congregations what to believe, but seldom go into any depth as to why any of it makes sense. Most Christians can tell you that Jesus was crucified and died, then rose again, and that if one asks Jesus into their heart, they will be saved; but most cannot adequately explain how they know this is true. They cannot explain fairly simple questions, such as why Jesus is the only way to salvation, or what it means to “ask Jesus into your heart,” much less more difficult questions about the supposed conflicts between science and the Bible, alleged Biblical contradictions, or why God allows pain and suffering. 1 Peter 3:15 says, “But sanctify the Lord God in your hearts, and always be ready to give a defense to everyone who asks you a reason for the hope that is in you, with meekness and fear.” The vast majority of American Christians can’t even coherently share the Gospel, much less taking the time to prepare themselves to be able to defend the Gospel or answer the difficult questions that intellectuals ask. Far too many Christians are intellectually lazy. As Denison puts it, “Christ’s call to have a childlike faith has been bastardized to a point that encourages blind acceptance of whatever we happen to have been told.” For intellectuals, blind acceptance is unacceptable. 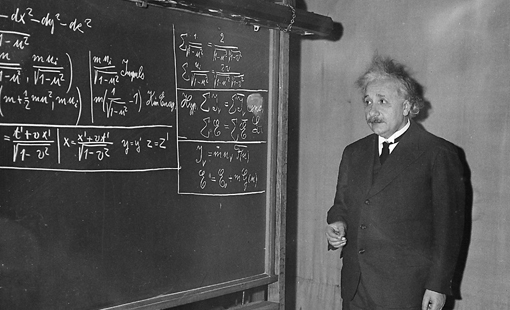 Scientists are rightly taught to think critically. If logical, valid reasons aren’t given for the truth of the Christian faith, most intellectuals will dismiss Christianity as nonsense. Unfortunately, very few Christians are prepared to give a reasoned, logical defense of the Gospel. Every person is born a sinner, separated from God. Every human being needs Jesus Christ to be saved from their sin, to have relationship with God restored, and to avoid Hell. While it may be easier for less intelligent people to admit their helplessness to save themselves, God loves scientists and intellectuals just as much. It is imperative that believers prepare themselves to always be ready to give a logical, reasoned defense to everyone who asks about the truth of Jesus Christ. While it is true that the Gospel must be received by faith, faith should not be “blind” faith devoid of any evidence or reason. 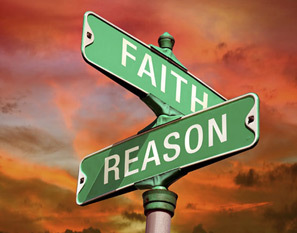 As the writer of Hebrews puts it, “faith is the substance of things hoped for, the evidence of things not seen.” This does not mean faith and reason are mutually exclusive; rather, faith is absolutely consistent with evidence and reason, but extends beyond what we can see, test, and logically comprehend based on evidence and reason alone. Christians are not called to a “blind” faith. We are called to diligently study and allow the Holy Spirit teach us to all truth. We are called to share the truth with all people, including intellectuals and scientists, in a way they can understand and embrace, so that they may know the Truth, and so the Truth might set them free. Once there was a geneticist who stumbled upon a series of genes responsible for human aging. He also discovered a method to turn those genes off, allowing people to live to fantastic ages of 1,000 years or more. However, being incredibly selfish, he told no one about his discovery; he kept the knowledge and the treatment to himself. Eventually, as others around him aged, yet he remained young, his secret was discovered. The selfish geneticist was condemned by all for his selfishness. They said, “Millions of lives have been needlessly lost, all because this selfish man kept the knowledge of how to prevent aging to himself, rather than telling the world about his fantastic discovery!” The selfish geneticist lived for more than another thousand years, guilt-ridden with the knowledge that he could have saved millions of lives, but didn’t. A number of people have recently asked why I spend so much time and effort on Facebook and with this blog arguing for the truth of the Gospel of Jesus Christ. Much like the selfish geneticist, I have discovered the reason people die. It would be selfish of me not to tell others about it. What I have discovered is not new; I’m certainly not the only person who knows about it. In fact, it’s been known for thousands of years, and millions know about it today. The answer to eternal life isn’t something I figured out on my own through superior insight or intelligence; rather, it’s so simple a child can understand it: The reason all people die is because we all sin. The cure is forgiveness for sin through the blood of Jesus Christ. So simple, yet so profound. Yet, there are many billions of people who either have never heard, or who refuse to listen. I believe with all my heart that when any person dies without first receiving Jesus Christ as Savior, they are destined for an eternity separated from God in Hell. Sin separates us from God, and there is nothing that any person can do on their own to remove sin from their lives. Only by entering into a relationship with Jesus Christ and having sin removed by His death on the cross can anyone avoid Hell. This is why I am so passionate in my efforts to evangelize. I would be a hypocrite not to. Many people who read my blog and/or Facebook posts would argue that God does not exist, or that absolute spiritual truth either does not exist or is unknowable. Yet, I know God exists, because I know Him; He lives in me. I know absolute moral and spiritual truth exist, because God has shown them to me. It’s not because there’s anything special about me; God wants everyone to know Him and to know the truth. I argue for the absolute truth of the Bible, not to win an argument, or to try to make myself out as some sort of spiritual genius, but because I want to expose the lies people cling to that prevent them from coming to true faith in Jesus Christ. God has blessed me with an analytical mind, so I tend to take a very analytical, logical approach to sharing and defending the Gospel. I realize that this approach isn’t for everyone; I often wish I was better at expressing myself in other ways. I’m working on it. But, since God has gifted me the way He has, I will continue to use what He has given me to try to help people understand that He exists, that He loves them, and that there is only one way to be reconciled to Him, through Jesus Christ. I know why people die. I also know the cure. It’s not a genetic disorder; it’s a spiritual disorder. The cure is Jesus Christ. Of this I am absolutely convinced: Millions have died and continue to die, and will spend eternity apart from God, unless they turn from their sin and receive Jesus Christ as Lord and Savior. What kind of horrible monster would I be if I kept this truth to myself?